EBG’s non-inductive thick film high-voltage resistors are specifically adapted to the needs of all customers. This individual customization makes them particularly effective for the respective applications. They are capable of regulating very high voltages, making them easily measurable and thus safer to handle. High-voltage resistors also regulate voltage in measuring instruments, which enables simple and low-cost measurement. Our high-voltage resistors are therefore crucial for the power supply units of sophisticated equipment such as X-ray units, laboratory equipment or applications in the field of aeronautical engineering. - TCR of ±25 ppm/°C combined with wide ohmic range (100 KΩ to 1 GΩ) and precision tolerances (±0.1 % to ±1 %). - TCR of ±80 ppm/°C combined with wide ohmic range (100 Ω to 10 GΩ) and precision tolerances (±0.1 % to ±10 %). - Standard TCR of ±50 ppm/°C and wide ohmic range (0.1 Ω to 30 MΩ). - Standard TCR of ±100 ppm/°C and wide ohmic range (100 Ω to 10 GΩ). 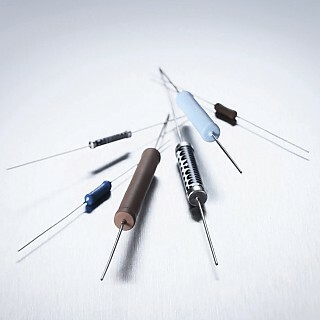 - High-voltage resistors with wide ohmice range (400 Ω to 100 GΩ). - High-voltage resistors up to 96 kV and 105 W.
- High-Power water-cooled single resistors and up to 10 kV operating voltage. - High-voltage resistor up to 50 W.